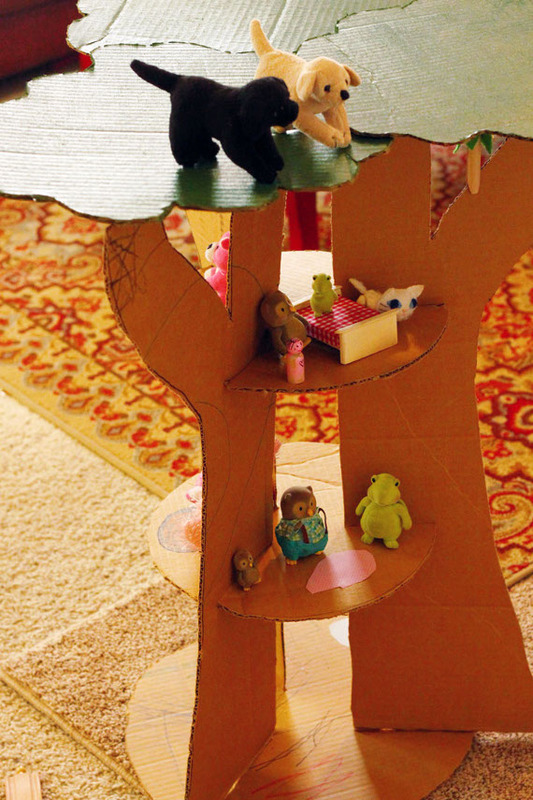 Make a whimsical variation on a dollhouse with this cute cardboard treehouse. There’s no pattern for this treehouse, I’m just explaining the basic construction technique I used. 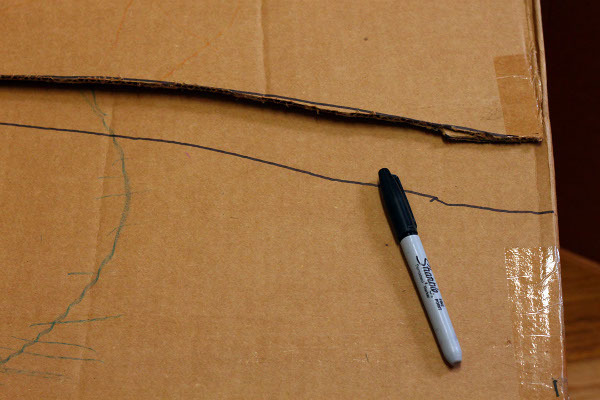 To begin, use your marker to draw your trunk shape. You can make it branch as much as you want, make it whatever shape you want, just remember that the trunk will dictate how tall your treehouse will be, so plan accordingly. I suggest giving the outer edge of your trunk a nice curve, making it wider at the bottom, and narrowing it as you go up–just be sure to make the inner edge of your trunk straight up and down, the top of any branches need to end up being the same level, as well as the bottom edge of your trunk; this will be required for assembling the treehouse. Cut out the trunk. 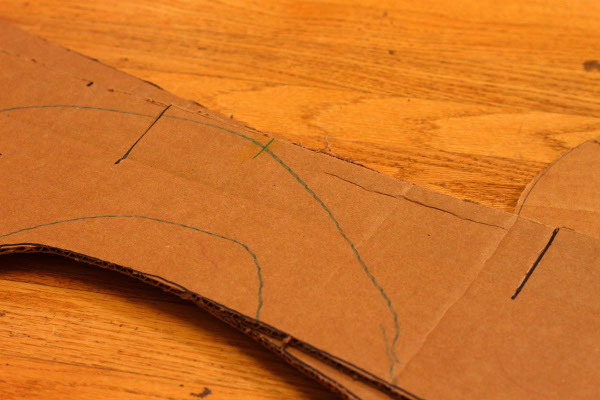 Using the trunk piece you just cut out, trace the piece onto your cardboard, and make 2 more identical trunk pieces. You need 3 total trunk pieces. Cut them out. 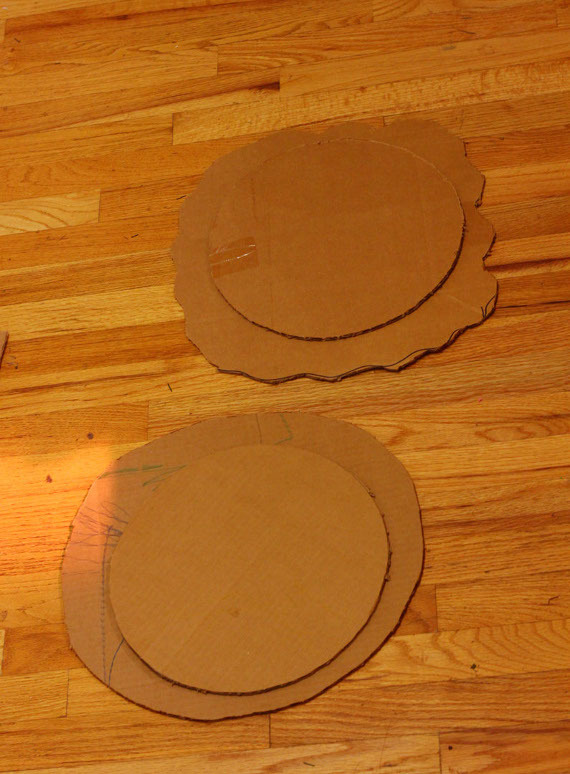 To make the platforms, you will need circles of cardboard. The size is up to you, I suggest making them no smaller than 12-inches though, or you will have to room to play. 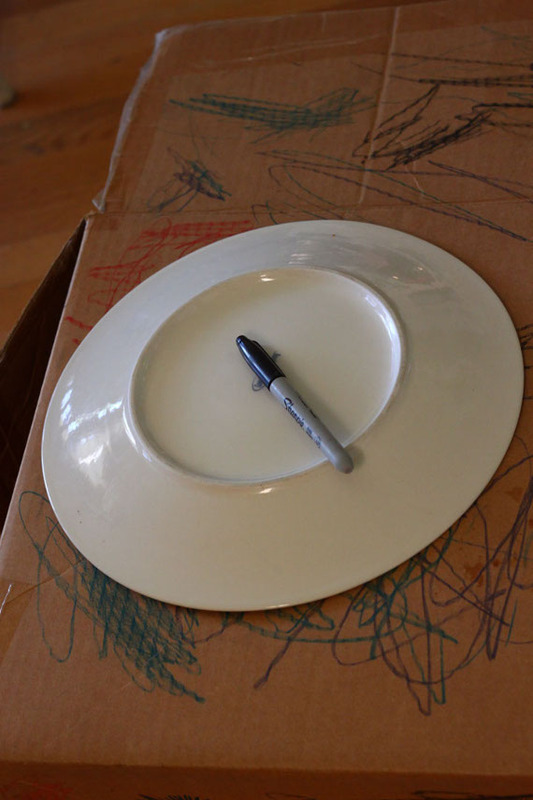 I made it easy on myself, and traced a large circular platter to make my rounds. Cut 2 (or more, depending on how many levels you’re making for your treehouse). Cut one circle that is a few inches wider in diameter than the pieces that you cut for your platforms–this will be your base. Take one of your platform circles. 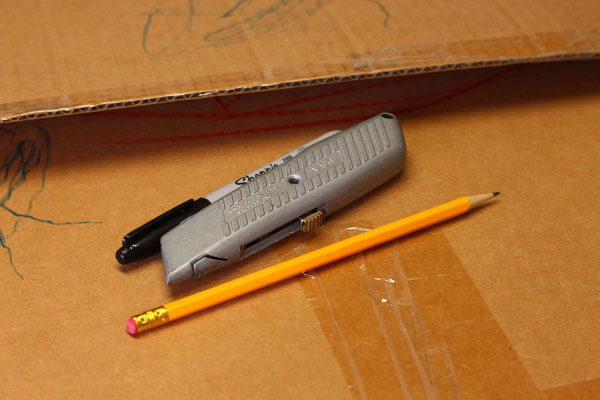 Using your pencil, make 3 evenly spaced lines around the edge of your circle. You don’t have to be super accurate, just eyeball it. At each of those 3 marks, use your ruler to to measure the same amount in towards the middle (I measured 2.5-inches), and make a line. Using your utility knife, cut on the lines, so you are left with 3 slits evenly spaced along the edge of the circle. Lay this circle on top of the other circle platforms you made, and use a pencil to mark the slits on other circles, cut them the same way. All your platforms should have identical slits cut into them. DO NOT cut slits into your larger base circle. 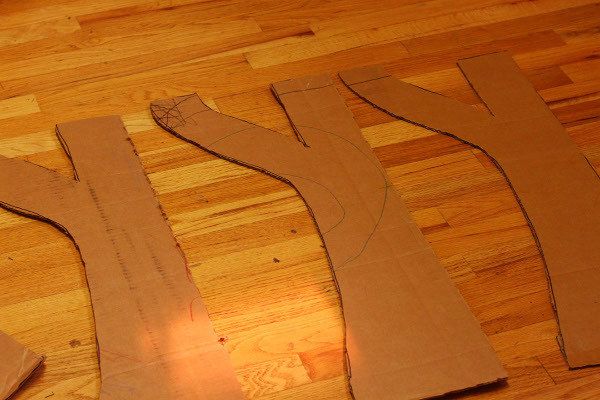 Lay one of your tree trunk pieces flat, and mark along the straight edge where you want each circle platform to rest. 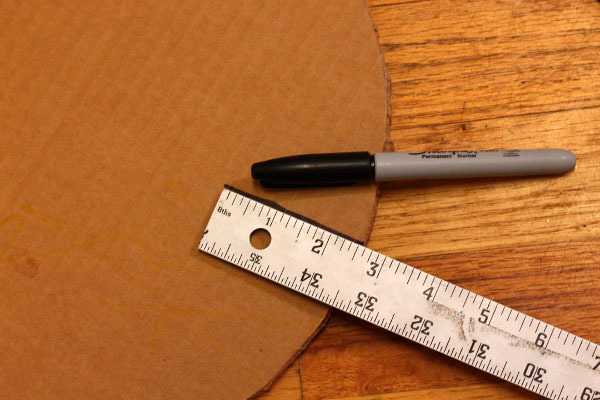 Use your ruler to mark lines that are the same length as the slits you made in your circle (mine were 2.5-inches, just like the slits on my circles). 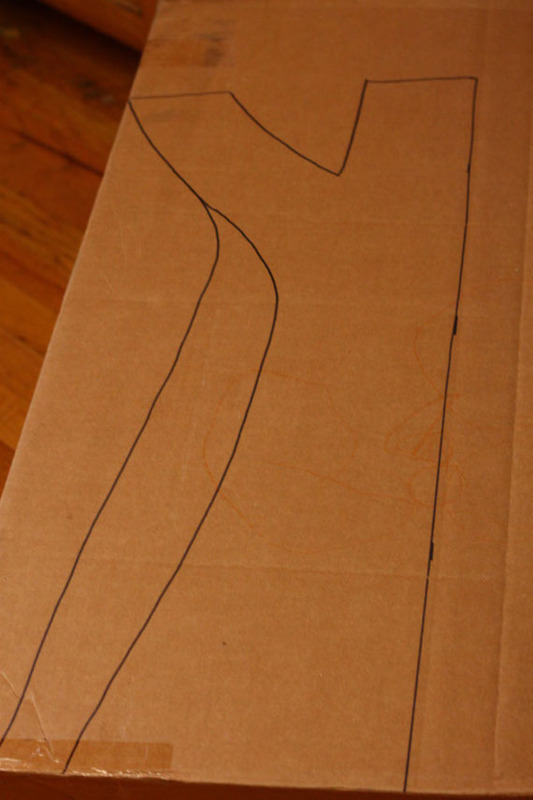 Use your utility knife to cut the along the lines, making slits. Take one tree trunk piece. Carefully insert the first platform slit into a slit on the tree trunk. 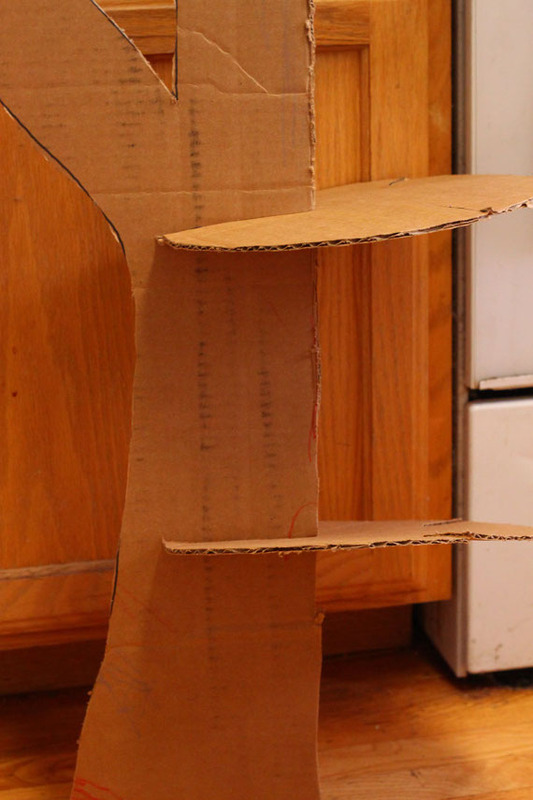 Push until the slits are fully together, and the cardboard pieces are snugly nested. Repeat with the all the remaining circle platforms on that trunk piece. Take the next trunk piece, and carefully slide each slit on the trunk, into the corresponding platform slit on the trunk/platform section of the tree that you just assembled above. Repeat with the third trunk piece. 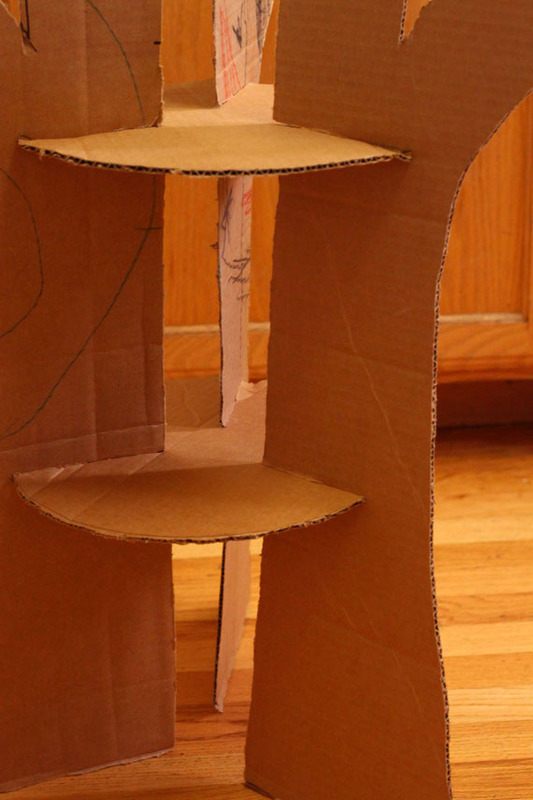 Use your hot glue gun to adhere the larger circle base to the bottom of your now assembled treehouse. Run beads of glue underneath each seam where the platforms join to the tree trunk to help reinforce the joint. 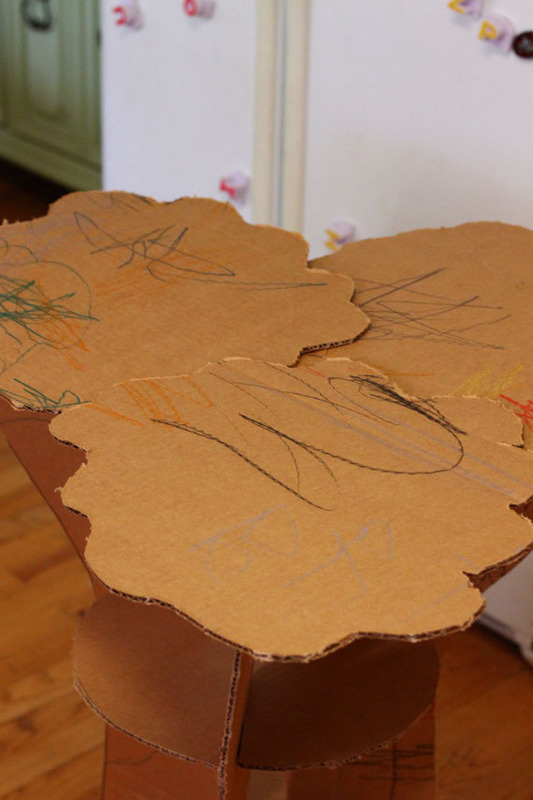 Cut some large scalloped circle shapes to overlap on top to make the tree top, or cut one really large scalloped circle for the top (if you have a large enough sheet of cardboard). Hot glue to the top of the branches to secure. 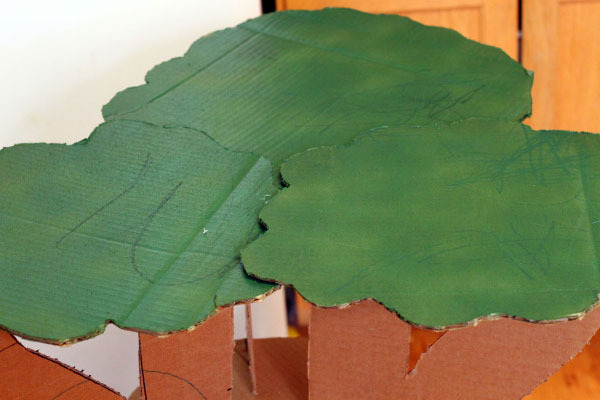 Color the tree top green–I used some green spray paint I had, but you could just as easily paint it with acrylic paint, or even use green crayons or markers. This is obviously just a very basic design that you can simplify, or make as complicated as you like. We used markers, crayons and scrapbook paper to decorate ours, but you could paint or draw on it to make it more fancy, if you desired. 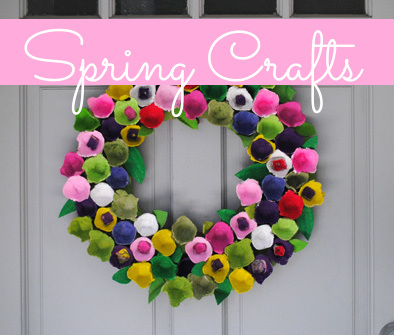 This is a great project to work on with the kids, with lots of room for creativity, and it results in hours of fun even after the building project is finished! 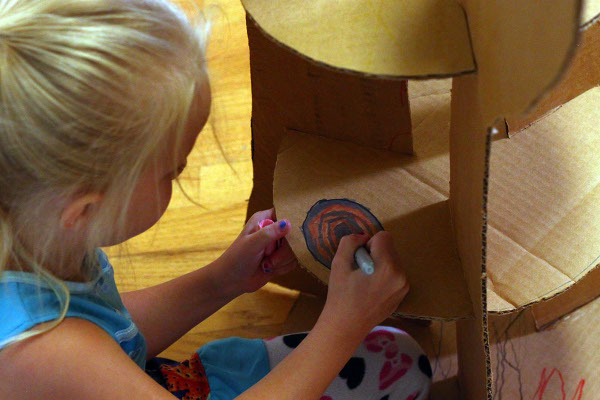 This entry was posted in Crafts, Family Crafts, Home Decor, Kid's Crafts, Recycled Crafts, Summer, Toddler Crafts and tagged Cardboard, DIY Toys, Upcycle on August 3, 2017 by Michelle. 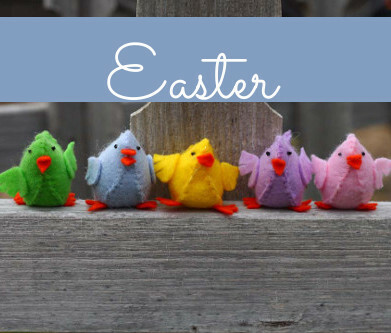 Michelle Hooper lives in Meridian, Idaho with her husband, twin first graders, and a couple cats. 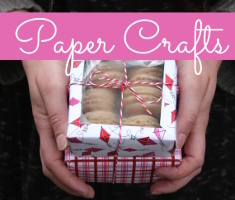 When she isn't busy chasing around her children, you can usually find her in her craft room, or at least that is what we imagine, because everything she makes is AMAZING! 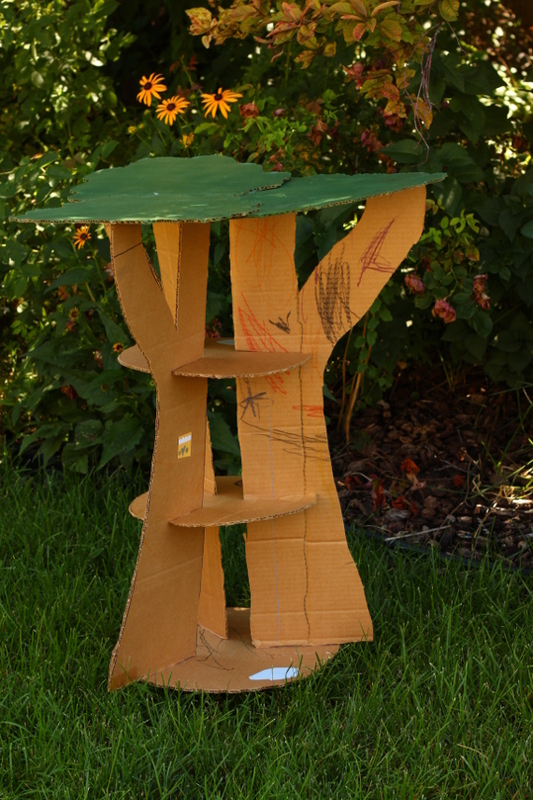 This Cardboard Tree House is just TOO cute for words! I’d LOVE to make this with my grandsons!